Buckskin Dan. A Baptist Survivalist who blessed us with bullets and songs from his guitar. 1. There are churches everywhere- it really is a very Christian country, yet there are also PSYCHICS everywhere. I thought this was weird. 2. Survivalists exist, and theres a lot of them in Arizona. 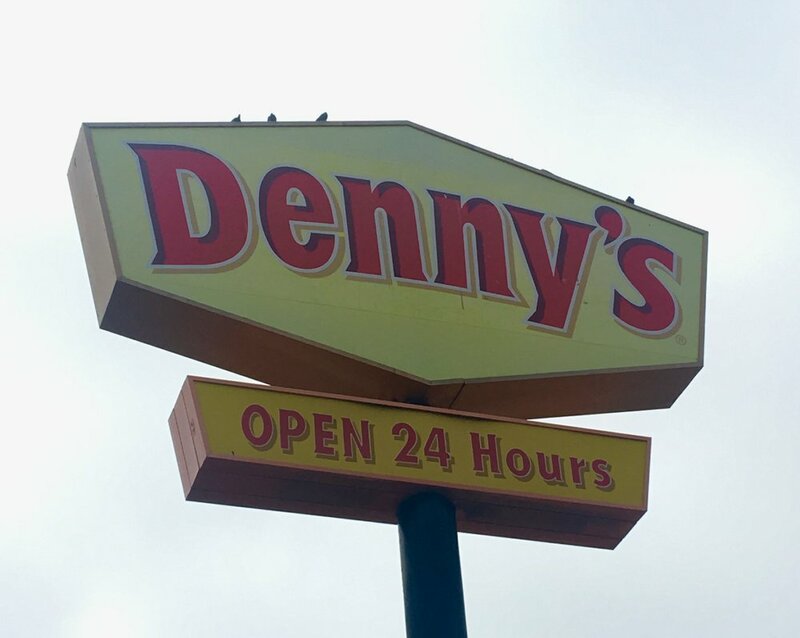 Denny's diner. Cheap, low quality of food but wickedly delicious- and all the strawberry lemonade you can drink for the price of a glass. 3. Diners are AMAZING. Free drink refills, pancakes and syrup with your eggs and bacon. Sometimes on the same plate. No alcohol though, as that's the devil's work. 4. Smokehouses are the future and I'm making one when I get home. 5. Alcohol is really cheap but you aren't allowed to buy it till you're 21. A shotgun though? You can buy that at age 18. In some states you can marry at 13 with parental consent. 6. Everyone is super friendly and they might actually mean it. Ashfork Diner, Arizona. Good coffee. Loads of food. Also signs telling you not to bother complaining which seemed ominous. 7. Poverty is huge. 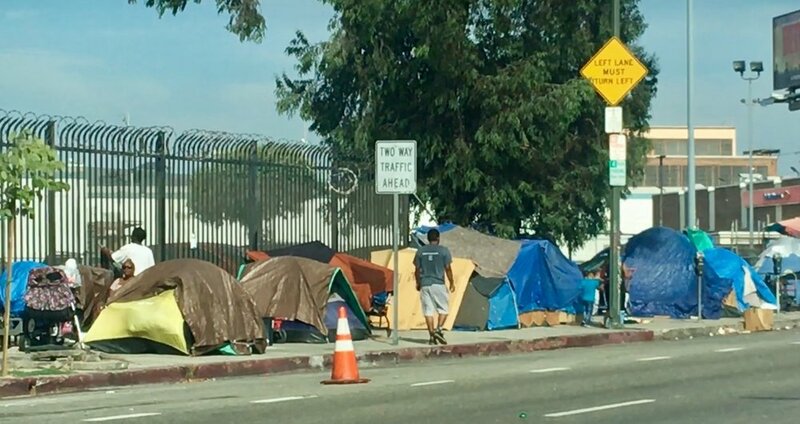 There are 50,000 people sleeping rough in LA alone. In a place that is dripping with money this is astonishing. Also if you become homeless and you have kids, they just take them into care. People who lose their home who have children just hide them in tents so they don't get separated. Awful. 8. Gambling is actually really depressing. Yes the lights and the shows are fun! But people feeding the slots who clearly need to save their money for their healthcare is sad. 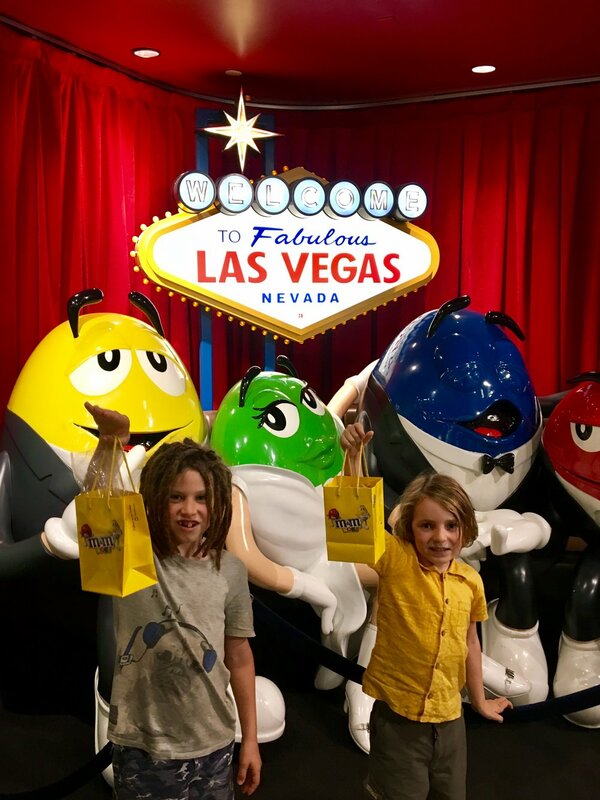 We liked the M & M factory at Las Vegas. Vegas felt like getting an invite to a glamorous Heroin Chic party circa 1996, only to turn up realise that Heroin-chic isn't real, it's just loads of people who are really ill and hurtling towards self destruction. Vegas felt a bit like that. 9. Everywhere on our road trip looked like a movie set. It is so ICONIC. Thelma & Louise, Breaking Bad, Fear & Loathing in Las Vegas, Psycho. SO many movies, its hard not to sashay around like a movie star. Especially when everyone treats you like a movie star because you sound like the queen. 10. The National Parks have nailed it- entrance fees are per car and free shuttle buses within the parks. Smashed it. Well done National Parks. 11. Buskers accept credit cards. 12. The radio stations play almost exclusively Latinx music, Christian rock or alt-rock from the 1990s. Great way of showing the boys the music we listened to when we were young- I had totally forgotten about Blind Melon. Also, they don't like female artists very much. we drove 4 hours in the car and not one single female artist was played. The radio had actual adverts telling you to be a good American and buy more stuff. Advertising is everywhere and status is king. 13. Malibu might be a nice place to live, but to visit is boring. 14. The roads are the most dangerous that we have ever seen. We saw six accidents on our drive to San Fransisco from LA. Red lights don't mean stop, they mean you can turn left. In turn, the green man at a pedestrian crossing actually just means go but WATCH OUT. Cannabis shop, round the corner from us. You can under take or over take or do whatever you want on a 5-lane freeway. 15. Motels look just like they do in the movies but with added ICE MACHINES which are free for guests. In the middle of the desert, this is amazing. 16. Walmart have huge shops that sell guns, DIY and scrapbooking materials, but their fruit & veg section sometimes is no more than 1 metre long. The Piñata section was 5 times bigger than their veg section. 17. Cannabis is legal and there's absolutely no stigma. Hooray for legalisation! 18. California is very cool and very retro. Beautiful bookshop in Studio City which was a converted theatre. We basically moved in. Would you like to look at something else? Would you like to subscribe to the blog? Want to read more related posts? Newer PostSharks, Parks and Route 66. Our great American road trip. Older Post14 hours in Dubai.